'Baahubali: The Beginning' fame singer L.V. 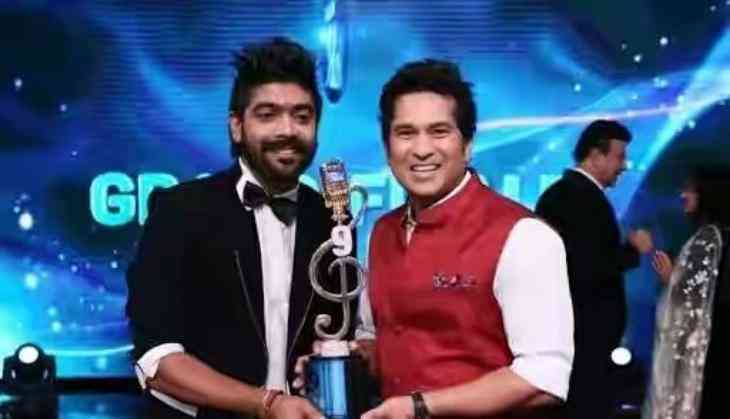 Revanth does not know Hindi, but he sang a number of Hindi chartbusters to win the ninth season of reality TV show 'Indian Idol'. He says there are no language barriers in singing, and he now plans to make a mark for himself in Bollywood. Revanth, who belongs to Visakhapatnam, in Andra Pradesh, and currently resides in Hyderabad, has lent his voice for more than 200 songs in southern films. He defeated Hyderabad-based P.V.N.S. Rohit and Punjab's Khuda Baksh on Sunday night to clinch the 'Indian Idol' trophy. He said that when it came to song selection, he had problems with diction. 'There were so many people, including my friends, who made fun of me. But I took it as a challenge. I want to make my market value,' said the singer, who lost his father even before he was born. 'Then me and my brother worked hard to get a livelihood. I want to have two voices now -- one for Tollywood (Telugu film industry) and the other for Bollywood,' added the 26-year-old. Revanth, who considers legendary singer Kishore Kumar as his idol, says his life has completely changed after appearing on the Sony Entertainment Television show, judged by Sonu Nigam, Annu Malik, and Farah Khan. He now wants to be known as a melodious singer. 'I have worked with various music directors down south, especially M.M. Keeravani. Keeravani is the person who groomed me. He told me, ‘Revanth try to sing melody songs rather than fast beat and party numbers',' Revanth said. 'He said to me that melody is timeless and can do wonders. But fast beat songs come on daily basis. So people forget them easily after a certain time. In southern industry, more than half of songs released are melody tracks only,' he added. Revanth says he will now learn Hindi in the 'next few months'. 'I wish to sing for all the actors like Akshay Kumar, Shah Rukh Khan or Salman Khan,' he said. Revanth, who sang the song 'Manohari' in the southern magnum opus 'Baahubali: The Beginning', is also excited about the release of its second part, 'Baahubali: The Conclusion' on April 28. 'I feel lucky to be part of ‘Baahubali: The Beginning'. That film completely changed my life. Sometimes I felt bad as I missed being in ‘Baahubali: The Conclusion'. If I had sung another song for the second part, that would have been great,' Revanth said. 'But I chose to be part of ‘Indian Idol'. So, it's fine now. I feel ‘Indian Idol' was my ‘Baahubali 2'. I am excited about the release of the second part,' he concluded.